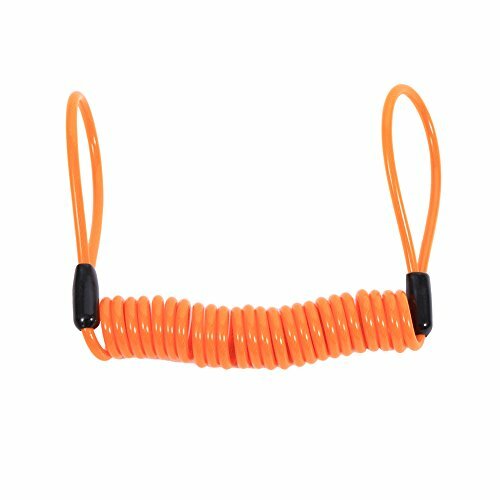 This item is a disc lock wire cable, which is lightweight, easy-to-pack, sharp colored coiled cable. It acts as a highly visual theft deterrent and prevents potential damage and embarrassment caused by riding away while the disc lock is engaged. Such a practical product, you will need it. 1. Made of steel coil cable and plastic wrapped, lightweight and easy-to-pack, colorful cable can satisfy your demand. 2. Multi-functional, suit for disk lock reminder brake safety. 3. 2 looped-ends: one for disc lock, the other for hand grip. 4. Can effectively prevent potential damage and embarrassment caused by riding away while the disc lock is engaged. 5. With good elastic, can be stretch to 1.5m, which can reach from short to tall handlebars. Height of Loop: 7cm / 2.76"
Stretched Length: Approx. 1.5m / 59.06"
Cable Inner Diameter: 2mm / 0.08"
Cable External Diameter: 3.5mm / 0.14"
Fitment: Fit for motorbikes, motorcycles, scooters, and bicycles (with all kinds of locks; password lock, ordinary lock, lock). 3. Do not ride off with your disc lock on your brake rotor ever again. View More In Noise Filters.